Kel Kade | “Kingdoms and Chaos” release tomorrow! “Kingdoms and Chaos” release tomorrow! 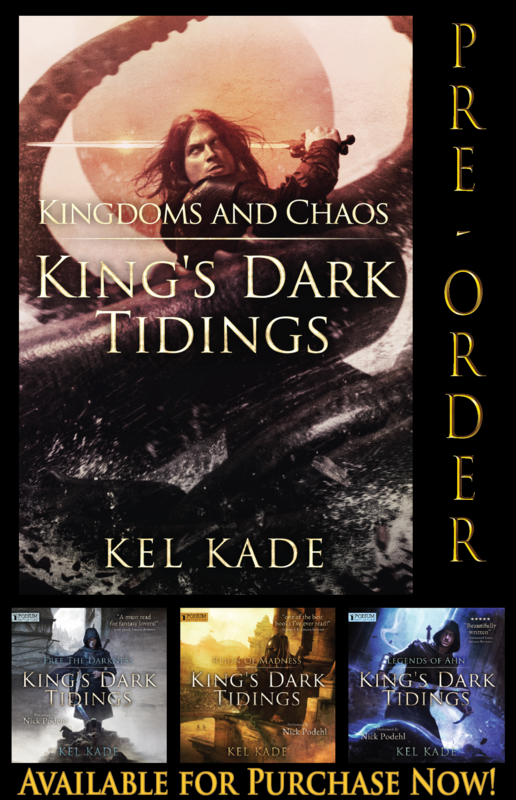 “Kingdoms and Chaos”, “King’s Dark Tidings” series Book 4 will release in ebook tomorrow, but you can pre-order it now and start reading as soon as it’s live! If you haven’t started reading KDT, you can get them on Amazon. Read them for FREE through the Kindle Unlimited program. Books 1-3 are currently available in audiobook on Audible and iTunes. Book 4 will probably be released in audio sometime in November. Also, don’t forget to sign up for my brand new newsletter to receive updates, special promotions, and giveaways directly to your inbox. Never miss another announcement! Visit my website to get on the list! Mr. Kade, this is an amazing work, thanks for the tour inside your head. Loved it. Frisha is going to dive me mad! That girl! Ugh. The only problem with finishing it so fast, I have to wait for the next book. Congrats on the book release man! Looking forward to reading it one of these days or picking up the audio book. I enjoyed it. The pacing improved quite a bit from book 3. Just finished it, what a ride, Tam is definitely best boy.